Have you been walking in the halls of RHS lately and almost slipped on nothing but the floor itself? Or getting up out of your seat in class, have you fallen back into your chair because it was too slippery to stand up? Well, you were not alone. 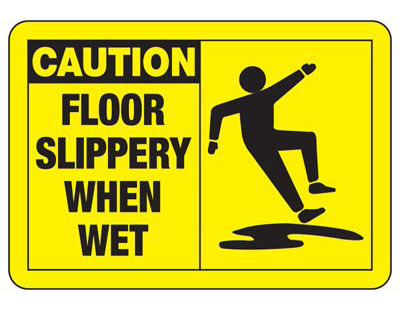 In fact you were in the majority of staff and students here at RHS pondering why the floors have been absurdly slippery lately. No one would disagree that the state of the floors was rather unsafe in both the halls and classrooms. Rumors have been floating around about the cause of the slick floors, whether it was due to “cheaper wax” being used on the floors, as many students are concluding, or due to the sticky, wet weather we had recently been experiencing. Principal, Dr. John Harrison says that it was due to the recent humidity and the condensation created on the floors. Furthermore, he explained that all teachers were advised to keep all windows closed in order to combat the effects of the weather. In short, Harrison declared the status of the floors had very little to nothing to do with a new waxing, but was just affected by the unseasonably humid weather we’ve been experiencing. The Rockland group at the Making Strides against Breast Cancer Walk last year. Juniors Jad Bendarkawi and Hannah Wyllie having fun at the event in Boston last year. Photos above are from last year’s Breast Cancer Walk. As in many years past, Rockland students are continuing to show support and awareness for Breast Cancer. For the past month, Rockland’s Student Council has been collecting change in A-Block classes in support of the illness. This week, the money will be collected and counted to see which class raised the most money. On Friday, RHS will have its annual Pink Out Day in which students deck out in pink attire and gear to show love and support for those battling breast cancer. To wrap up the week, on Sunday, Oct.1 at 6:40 am students are congregating at the high school to board busses for the annual, Making Strides Against Breast Cancer walk that will take place in Boston at 8am. These events are planned in part by Student Government’s student services committee run by junior Katy Buckley. Be sure to reach out to her with any questions. Be sure to support the cause and wear your pink this Friday! On Saturday, September 22 the Sole of Rockland will be unveiled at the Rockland Memorial Library. Townspeople created the footprints and RHS art students recreated them as part of the project to highlight the many local attractions that are important in Rockland. Saturday, Sept. 22 will be a fun, spirited day for the Bulldog community from Clean Up day, to the Sole of Rockland celebration, and Dog Walk, there will be something for everyone to do this weekend. To start the morning off, Reimagine Rockland is partnering with the Open Space Committee, Rockland Highway Department, and Rockland Park Department for a fall Clean Up Day along Union Street and the Rail Trail. Home Depot will support the effort, as well. Similar to last year, all citizens are invited to help clean up the town’s most used walking areas. After that, volunteers can head to the Rockland Memorial Library for lunch and to celebrate the Sole of Rockland Unveiling. Here, shoe print art and footprints have been decorated onto some of Rockland’s favorite spots that were identified by residents on Rockland Day and at the Rockland Farmers Market. After a night’s rest after the busy Saturday schedule, people are welcomed to bring their families and dogs to join the Dog Walk on Sunday, Sept. 23. The walk will start at the Rockland Senior Center, proceed down the Rail Trail and Union Street, and will loop back around to the senior center. RHS art students learn how they will do their sidewalk art footprints on Friday, Sept. 14. During today’s C, D, F and G block classes, many of Ms. Cheryl Thompson’s art students participated in decorating the sidewalks of Rockland for next Saturday’s Sole of Rockland Celebration. Led by Massachusetts Area Planning Council (MAPC) artists, Annis Sengupta and Carolyn Lewenberg, students painted the sidewalks with murals of shoe prints and footprints in the residents’ favorite Rockland locations. Join the Open Space Committee, Rockland Highway Department, and Rockland Park Department for a fall Clean Up Day along Union Street and the Rail Trail followed by the Sole of Rockland Celebration on Saturday, Sept. 22. As fall is settling into place so is everyone here at the high school. With the fall sports season underway and clubs revving into gear, RHS is going full speed into this school year. One of the main events going on right now is the Breast Cancer fundraiser. A Block classes are competing to see which class can raise the most money to help support awareness and research for breast cancer. The class with the most money will earn a prize. 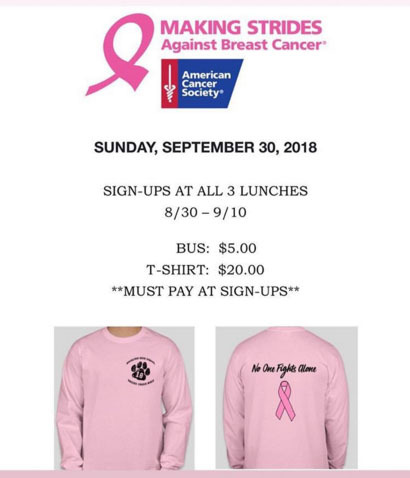 Furthermore, at all three lunches students can sign up for the annual Boston Breast Cancer Walk that will take place on Sunday, September 30. Along with these sign ups at lunches, this week class officers are beginning to sell this year’s class shirts for the Pep Rally that’ll take place October 12. Each of the class’s shirts are being sold for $20. Tonight the Travel Club will be holding an informational meeting about the April 2021 trip to Greece at 7pm in the Lecture Hall. Also in Travel Club, an informational meeting for the Australia and New Zealand 2020 trip will be held on Tuesday, Sept. 18 at 7pm in the Lecture Hall. See club advisor, Ms. Walsh, with any questions. Tomorrow night at 6:15 at the Holy Family Church the Rockland Cares Foundation will be holding its annual Vigil in remembrance of the lives loss and families effected by drug abuse. Next Wednesday at all three lunches sign ups will begin for the annual Mr Rockland pageant that will take place Wednesday Oct. 17 at 7pm in the auditorium. Sign ups are available for all senior boys who are interested in competing to be 2018’s Mr. Rockland. A new school year welcomes a new class entering the walls of RHS. This year’s freshmen will be the graduating Class of 2022 and after a full week here at high school, many are starting to find their way around the building and settle into their home for the next four years. In the Freshmen Orientation and the Class of 2022 meeting on the first day of school, the students heard from faculty members including principal, John Harrison, school resource officer, Ethan Schnabel, and guidance director, Margie Black. To provide additional help with their transition, the Veritas interviewed several upperclassmen to uncover their tips and advice to the newbies at the school.